I have hunted since I was 8 years old, I have, like millions of other America hunters, dreamed of getting a trophy buck. That has yet to happen. But what has happened is that everything I am able to bag has gone into my freezer or into feeding programs for the poor, like Hunters for the Hungry. The idea of trophy hunting is repugnant. To kill an animal just for a trophy is wrong. And it is especially abhorrent when the cost of acquiring such a trophy is in the tens of thousands of dollars. 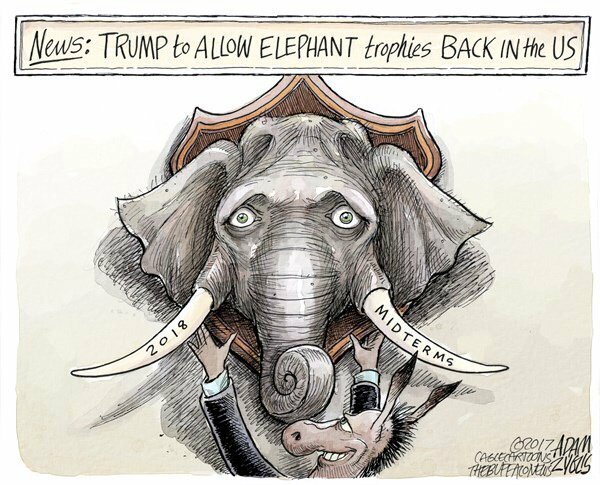 Trumps decision to allow elephant trophies into the USA is another gift to the powerful elite. Lifting the restriction is yet another demonstration that the #BLOTUS is looking out for the wealthy, with no concerns for anyone else. Hopefully, he will see the error of his ways, even sooner than 2018. This entry was posted in Hunger & Poverty, News & Views and tagged 2018 Midterm elections, BLOTUS, Hunters for the Hungry, powerful elite, restriction, trophy hunting, Trump, wealthy on November 20, 2017 by Ray Buchanan.